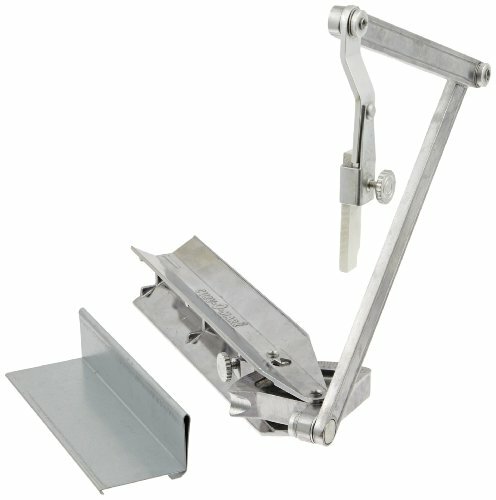 Compact, time-saving tool used to lay out pipe and structural steel joints. Ideal for quick, precise layout of laterals at any angle, tees, wyes, crosses, elbows, any type or size of joint. Eliminates complicated mathematical formulas, cut and try, and need less material waste. Can be used to lay out pipe from 1-1/2 to 18 in diameter, or structural steel members up to 18 inches in a right side up or upside down position. Consists of an X-shaped frame, calibrated protractor, and a triple-jointed marking arm and holder. Easy to use, aimed to use longer, there are Curv-O-Mark tools to help bring precision to most any layout task. Holder accepts a soapstone crayon (included), felt pen or pencil. Protractor is calibrated on both sides - one in degrees, the other in rise-inches-per-foot - to service any type of measurement need.